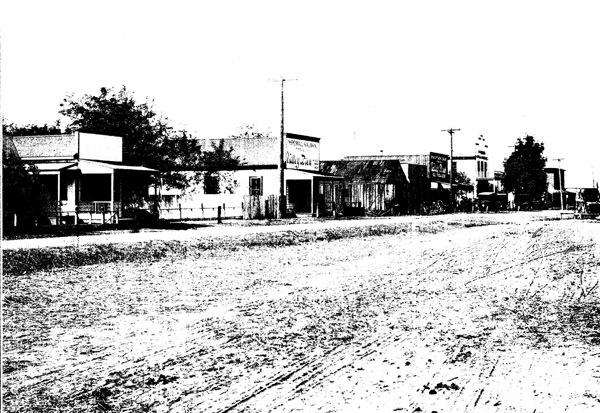 The town of Knightsen was founded in 1898 when the Santa Fe Railroad began a preliminary survey through the area to determine where tracks would be laid and which right–of-ways should be purchased for a line into Stockton. The railroad spent a year and a half grading the road bed and laying tracks expecting the first passenger and freight trains to arrive during the spring of 1900. Knightsen’s first buildings were the Santa Fe station house, a railroad station, and a pumping plant to supply locomotives with water and supplies. Harvey Rook was the first Santa Fe Railroad agent assigned to Knightsen. He later married George Knight’s daughter. The Santa Fe Railroad originally wanted to name the site Meganos after John Marsh’s Los Meganos Ranch that once covered much of East County. Settlers in the area preferred the name of Knightsen after the George Knight family which stood to lose a portion of their farm land for construction of the railroad. To assure the town would be named Knightsen, residents wrote to Washington D.C. and secured a post office under the name of Knightsen before the railroad construction was completed. During the winter of 1899, George Knight was commissioned as postmaster of the new town named after his family (a position he held for thirteen years). He immediately built a post office and grocery store, the first retail establishment in Knightsen. Soon to follow was an asparagus packing plant built by the Lynon Brothers which during harvest season would load and ship two to four freight cars full of asparagus stalks daily. As early as the 1880’s settlers planted the first almond trees and dairymen had established their dairies in the Knightsen area. Some of these men were: M. A. Walton, L.G. Barkley, W.F. Pierce and Oscar Smith. By the 1890’s, George Knight, Thomas Murphy, William Shafter, John Byers and W.W. Sterling were also producing almonds, apricots, grapes and alfalfa. Prior to establishment of the railroad, farmers shipped their milk and cream to market on the same vessels which transported fruit and nut crops from Babbes Landing, a channel off Dutch Slough at the north end of Sellers Avenue. With the arrival of the railroad these growers and dairymen had easier access to transportation for their crops and milk to market. There were six main dairies shipping a daily average of 2,500 gallons of bulk milk to Bay Area markets. The Stone Brothers established the first large dairy followed by Fox, Bridgeford, Burroughs Brothers, Emerson and Hotchkiss. During the 1920’s Knightsen was one of the largest milk shipping depots in the state of California. Knightsen residents found they could board a train at eight in the morning bound for Stockton, spend the day shopping and attending to their business, then return home by five in the evening. In the early 1900’s, the town of Knightsen consisted of Henry W. Heidorn’s general store, a post office, Art English’s Saloon, Frank Stone’s Imperial Café, William Redmond’s Blacksmith shop, the Santa Fe Depot, several warehouse and a respectable number of residents. The residents of Knightsen established a small park in the middle of town consisting of a lawn, colorful flowers, and several eucalyptus trees where townsmen could sit and visit on a warm summer’s day enjoying the delta breeze. A tall flag pole was erected in the middle of the town where school children often presented patriotic programs. By 1913, electric lights were installed, and the citizens could boast about their business district. In 1920, after an overwhelming election, the Knightsen Irrigation District was formed to irrigate 10,000 acres of local farm land. The project cost $650,000. The first board consisted of Henry Heidorn, president; Adrian Shafer, assessor and controller; A.E. Bonnickson, treasurer; C.H. Noyes, secretary; and directors John Minta, Edwin Sellers, George Smith, Frank Estes and Byron Grigsby. However, before completion of the project. the district had become part of the East Contra Costa Water District. The change from dry farming to irrigated fields brought many changes to the area. John N. Kristich, a pipe manufacturer from King City, established a branch of his firm in Knightsen. The concrete pipe manufacturing plant was located next to the railroad tracks, south of Delta Road, and across the street from Knightsen School. In the 1920’s, Kristich was one of the largest manufacturers of concrete pipe in California. Kristich made $170,000 worth of pipe for Knightsen Irrigation District, and $25,000 worth of pipe for the Byron-Bethany Irrigation District. The Knightsen Farm Bureau was organized in 1918. Their first meetings were held on the second floor of Heidorn’s Store, with Benjamin Burroughs as president; Henry Heidorn, vice president; Lillian Fotheringham, secretary; and George Somerhalder, director. The organization built a hall in 1922 on three lots donated by George Knight, which later became the heart of the community. Over the years the hall has been used for school graduations, dances, weddings, political functions, school plays, holiday celebrations, church services, a safe haven for flood victims and an endless list of other events. Knightsen has a wonderful history and has definitely left its mark on East Contra Costa County.